Germans take Antwerp, Belgium’s second city. 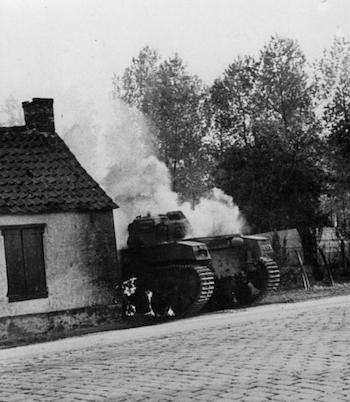 Allied forces are seriously split as German tanks of 19th Panzer Korps (Guderian) reach Peronne and Rommel’s 7th Panzer Division reaches Cambrai during their rapid advance toward the Channel coast. Amiens is occupied. Regions ceded to Belgium in Treaty of Versailles (1919) re-incorporated into Germany. British air raids on Germany continue. Italy annexes the Yugoslavian territory of Dalmatia. General Dentz tells the French Army in Syria to “match force with force”. The 5th Indian Division captures the Italian fortress of Amba Alagi after 18 days of fighting. The British column from Palestine (Habforce), arrives at Habbaniyah and relieves its garrison. New York ends night baseball games for the rest of World War II. The RAF launches a major attack against Mannheim. The Royal Navy’s Fleet Air Arm attacks and hits the German heavy cruiser Prinz Eugen off Norway, but she makes it back to Kiel. Despite increasing losses, Churchill remains determined to continue the Artic convoys to Russia. German forces finally halt the Russian summer offensive just short of Kharkov and let loose Group von Kleist’s with a strength of 15 Divisions (1st Panzer Army and 17th Army), of which two are Panzer and one Motorized. The Germans aim for Izyum to the South of Kharkov in order to pinch off the Russian salient. The Germans attack with their usual skill, technology, and ferocity and drive through the Russian defenses. The Germans have a 4.4-1 edge in tanks, 1.7-1 edge in artillery, and 1.3-1 edge in infantry on the battlefield. Russian co-ordination is poor and the Germans quickly gain local air superiority. Russian officers lack adequate combat experience to handle the fast pace of the German blitzkrieg, and their divisions literally come apart. The Japanese launch a new offensive along the Yangtze river, 250 miles north east of the Nationalist capital of Chunking. Polish troops finally capture the town of Cassino.